There are several companies producing whisky in Japan, but the two best-known and most widely available are Suntory and Nikka. Both of these produce blended as well as single malt whiskies and blended malt whiskies, with their main blended whiskies being Suntory kakubin (角瓶, square bottle), and Black Nikka Clear. There are also a large number of special bottlings and limited editions. The first westerners to taste Japanese whisky were soldiers of the American Expeditionary Force Siberia who took shore leave in Hakodate in September 1918. A brand called Queen George, described by one American as a "Scotch whiskey made in Japan", was widely available. Exactly what it was is unknown, but it was quite potent and probably quite unlike Scotch whisky. In 2004, the 18-year-old Yamazaki was introduced to the US. Japanese whiskies have been winning top honors in international competitions, notably Suntory. At the 2003 International Spirits Challenge, Suntory Yamazaki won a gold medal, and Suntory whiskies continued to win gold medals every year through 2013, with all three malt whiskies winning a trophy (the top prize) in either 2012 (Yamazaki 18 years old and Hakushu 25 years old) or 2013 (Hibiki 21 years old), and Suntory itself winning distiller of the year in 2010, 2012, and 2013. The resultant acclaim nudged Japan's distilleries to market overseas. Further, in recent years (as of 22 March 2014) a number of blind tastings have been organized by Whisky Magazine, which have included Japanese single malts in the lineup, along with malts from distilleries considered to be among the best in Scotland. On more than one occasion, the results have had Japanese single malts (particularly those of Nikka's Yoichi and Suntory's Yamazaki) scoring higher than their Scottish counterparts. One facet of the style of Japanese whisky comes from the way in which blended whisky is produced, and the differing nature of the industry in Japan. Despite the recent rise of interest in single malt whiskies, the vast majority of whisky sold in the world is still blended. In Scotland, while a particular brand of blended whisky may be owned by a company that also owns one or more distilleries, it is common for blended whisky bottlers to trade single malt whiskies. The components of a blend may involve malt whisky from a number of distilleries, which may be owned by different companies. In Japan, however, the industry is vertically integrated, meaning whisky companies own both the distilleries and the brands of blended whiskies, and do not trade with their competitors. So a blended whisky in Japan will generally only contain malt whisky from the distilleries owned by that same company. Japanese whisky is consumed either like Scottish whisky or like Japanese shōchū. The bulk of Japanese blended whisky is consumed in cocktails, notably as whisky highballs (ハイボール, haibōru) (similar to shōchū highballs, known as chūhai), while fine whisky is primarily drunk neat or on the rocks, as with Scotch whisky. Advertising for blended whisky generally features it consumed in a highball, and highballs made with Suntory's Kakubin are branded kaku-hai (カクハイ). In addition to soda (in a highball), Japanese whisky is often drunk mixed with hot water o-yu-wari (お湯割り), particularly in winter, or cold water mizu-wari (水割り), particularly in summer, as is done with shōchū. Whisky is also commonly drunk with food, particularly in mixed drinks, especially highballs. The prevalence of mixing whisky with soda or water is particularly attributed to the hot, muggy Japanese summer, hence the popularity of long drinks. ^ Chris Bunting, "Japanese Whisky: ‘It's Called Queen George, and It's More Bitched Up Than Its Name’," in Fritz Allhoff and Marcus P. Adams, eds., Whiskey and Philosophy: A Small Batch of Spirited Ideas (Hoboken, NJ: John Wiley & Sons, 2010), pp. 302–17. ^ "'Yoichi' Marked the Highest Score Among the 47 Brands in the World" Archived 22 April 2009 at the Wayback Machine. Nikka Whiskey. Accessed 22 October 2009. Bunting, Chris (June 2011). "Japanese Whisky 101: Beginner's guide to Japanese Whisky". Connosr Distilled. Connosr Ltd (#4). Ashcraft, Brian (2018). Japanese Whisky: The Ultimate Guide to the World’s Most Desirable Spirit. North Clarendon, VT: Tuttle Publishing. ISBN 9784805314098. Broom, Dave (2017). The Way of Whisky: A Journey Around Japanese Whisky. London: Mitchell Beazley. ISBN 9781784721428. Roskrow, Dominic (2016). Whisky Japan: The Essential Guide to the World's Most Exotic Whisky. New York: Kodansha USA. ISBN 9781568365756. Van Eycken, Stefan (2017). Whisky Rising: The Definitive Guide to the Finest Whiskies and Distillers of Japan. Kennebunkport, Maine: Cider Mill Press. ISBN 9781604336979. 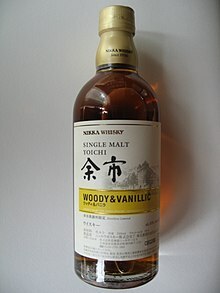 Wikimedia Commons has media related to Whisky from Japan.